Nickelodeon has posted an early two-part Teenage Mutant Ninja Turtles episode called Wormquake! (also listed as "The Manhatten Project" a nice touch calling back to the old TMNT video game) on their website. I'm not sure why Nickelodeon decided to debut this episode on their website 2 weeks early, but it's definitely worth watching. With episodes 13-14 they have taken quite a jump in production, even more than they already have been doing this whole season. The writing and directing on this is far better than what they were doing in season one and it just keeps getting better. 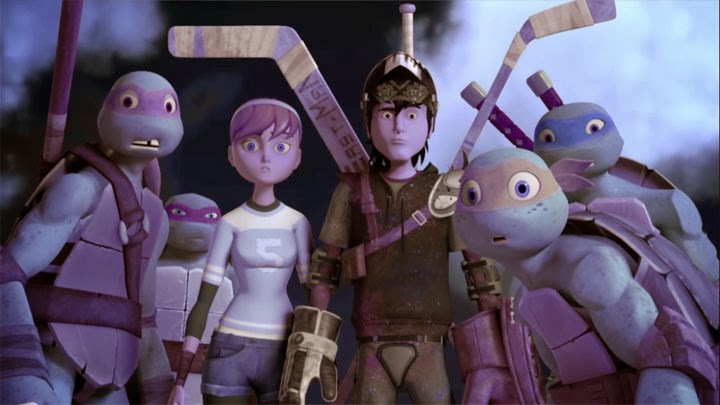 Anyway- the episode splits into two stories, one follows Donnie, April, and Casey making an awkward love triangle while dealing with the Kraang and the second follows Mikey, Leo, and Raph fighting the Shredder and his fighters. The split happens once they get separated in a Kraang device that creates doorways into other dimensions- although they all end up back in the correct one, despite the separation. We get a new bad guy called Tiger Claw (he seems like Boba Fett crossed with a Thundercat) that helps Karai capture 3 of the turtles and lure in Splinter, who gets into a showdown with the Shredder himself. In something interesting this episode gives Karai some hesitation in destroying Splinter, and second guesses the Shredder's moral standing- he wants to kill SPlinter in an honorless fashion. Even Tiger Claw agrees. Tiger Claw also has a mentioned back story about his tail being cut off, but no details were given. (unintentional pun... (sorry... that was PUNintended)) I think we'll see him again, and I wonder if he's in the same place Leatherhead was left in? Donnie, Casey, and April end up finding the source of the earthquakes, that being the worms of the title. They are possibly a nod to either Dune or Tremors with their tri-fold mouths. Well, they end up sending the worms away and crossing paths with Splinter and the other 3 in an epic battle in the city. Honestly this episode has two of the best moments I've seen in the series yet. 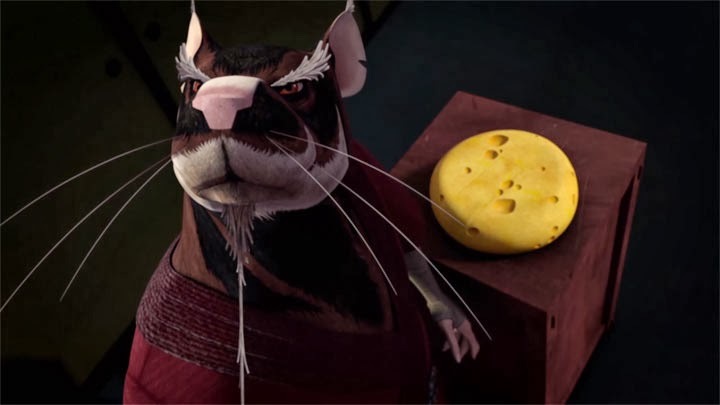 The first is how master Splinter says, "The cheese-phone! Truly an emergency!" And the second is Donatello's reaction to seeing the classic cartoon version of April O'neil in her yellow jumpsuit. This episode has great homages to old stuff. Casey's line about cricket and crumpets being similar to the first film, the Dune (or Tremors) worms, and a couple scenes done in the 1980's TMNT cartoon style, complete with what I believe to be the actual voices from that series! The old cartoon style might be a way to fit this cartoon in with the amazingly well done Turtles Forever movie through Kraangs' dimensional doorways- creating a multiverse. As it stands, this is probably the best episode (both parts combined) they've done. If you haven't seen Turtles Forever, I highly recommend finding it online somewhere, it is unbelievably well done. 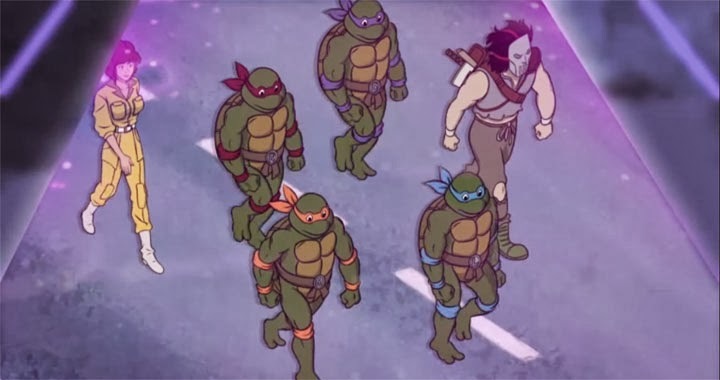 They mix up a few different styles of the TMNT and it adds levels of commentary to the film by the way they interact. They even wonder about the 80's turtles' habit of talking to the viewer/camera when it happens. I laughed hard at a lot of scenes in these episodes, I kinda think that Tigerclaw flying into the worm's mouth was an homage to Boba Fett's tumble into the Sarlacc's mouth too! This show is constantly including references and throwbacks to so many movies and shows, it's an absolute treat for us viewers! PS: Thank you for commenting here!